I have yet to meet one person that is indifferent to the distinct bitter taste of broccoli rabe -you either love it or you really don’t like it. You probably already know that I love broccoli rabe, bitterness and all, especially when it is combined with pasta. One of my favorite classic combinations is broccoli rabe with Cavatelli. Today, we are going to transform this wonderful green vegetable into a soup. 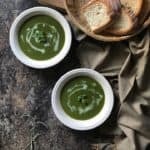 What do I need to make Broccoli Rabe Soup? Olive oil. Investing in a good quality oil really does make a difference. Onion. Mild, aromatic and flavorful. Garlic. Can’t have broccoli rabe without garlic. Broccoli Rabe. No surprise here! Vegetable Broth. A homemade broth is always the best. Red Chili Flakes: Totally optional. Milk. Just a splash will provide a garnish with a nice color contrast. As far as accessories are concerned, you need a colander, a large stockpot with a cover and a wooden spoon. 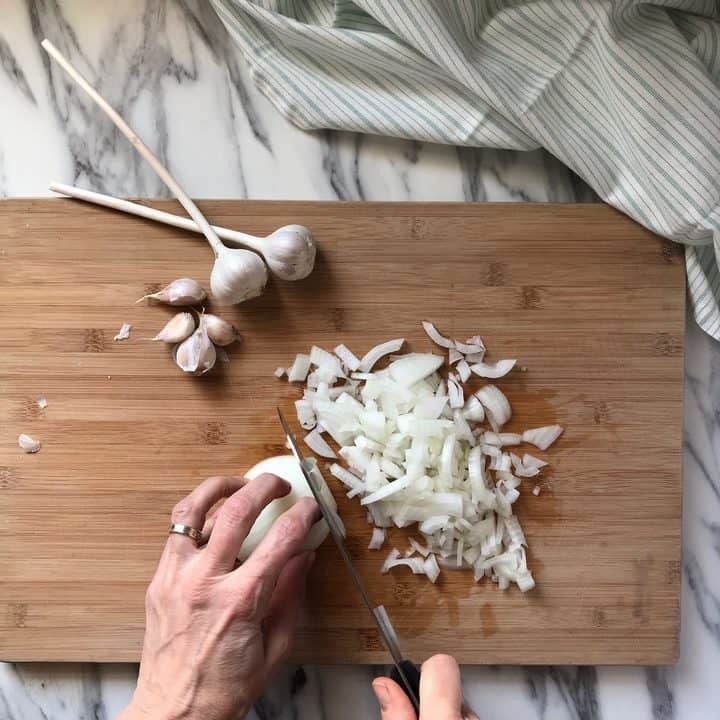 In order to chop the vegetables, you will need a cutting board and a sharp knife. Finally, in order to blend the soup to a creamy consistency, a hand-held immersion blender makes the whole process easier. Fill a large stockpot with water, cover and bring it to a rolling boil. While waiting for the water to boil, start to prep the vegetables. Chop the onion, mince the garlic and trim the ends of the broccoli rabe. When the water comes to a rolling boil, blanch the broccoli rabe for a few minutes until the stems are tender. Remove from water, and place in colander. Heat olive oil in large pot over medium heat. Add the chopped onion and cook for about 5-7 minutes until softened and translucent. Next, add the minced garlic and stir for a minute or so. Finally add the blanched broccoli rabe and stir fry a few more minutes. At this point season to taste with salt, pepper and chili flakes (optional). Since we are making a soup, add the vegetable broth and a bay leaf. The addition of the grated potato will contribute to the overall silky texture of the soup. Allow this rapini soup to simmer gently for about 15 minutes. The last thing that needs to be done is to use a hand-held blender and transform the soup into a smooth consistency. Don’t forget to remove the bay leaf. Reheat gently before serving. Garnish as desired. The grated potato is essential in order to give this Broccoli Rabe Soup a creamy texture. Garnishing can include olive oil, yogurt or milk. For a little more decadence, cream can be used in moderation. This soup is great served with Italian crusty bread. Frozen or fresh Broccoli Rabe can be used. To transform this bowl of soup into a meal, add some protein in the form of lentils, chick peas or borlotti beans. Broccoli Rabe would often make an appearance at supper time during my youth. It was one of those vegetables that would be served at least once a week. I can still remember the different reactions my siblings would make when my mom would serve this soup. Let’s just say that we all have different tastes! 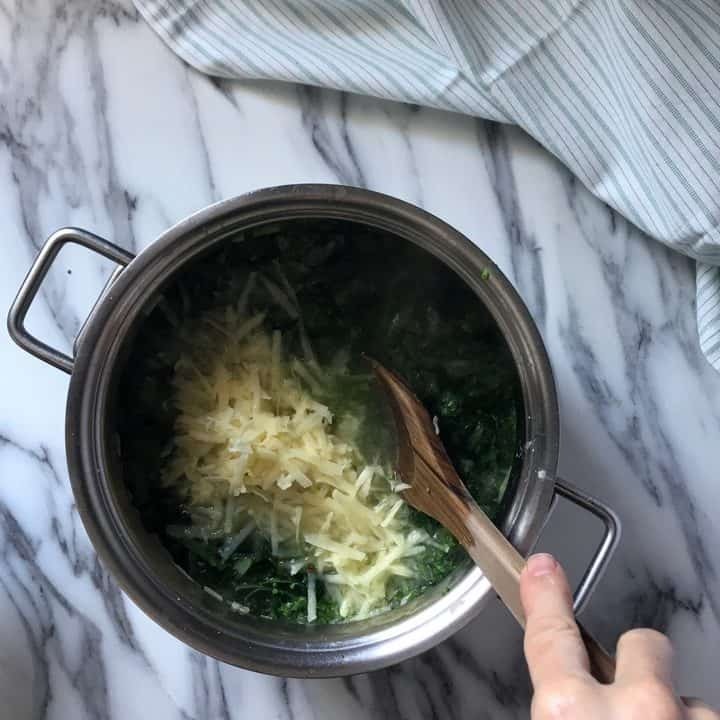 So if you have tried broccoli rabe in the past and were “indifferent” to it, I would invite you to try it again in the form of a Broccoli Rabe Soup… you might just like it! 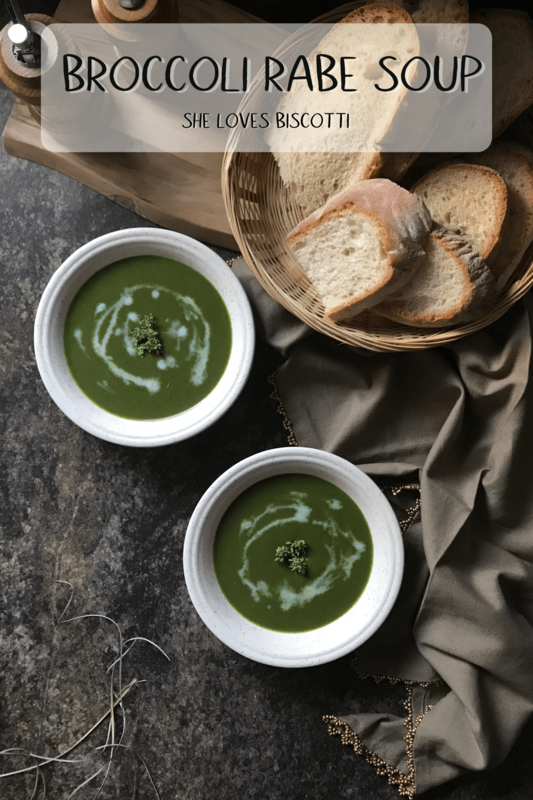 ★★★★★ If you have made this recipe for Broccoli Rabe Soup, I would love to hear about it in the comments below and be sure to rate the recipe! 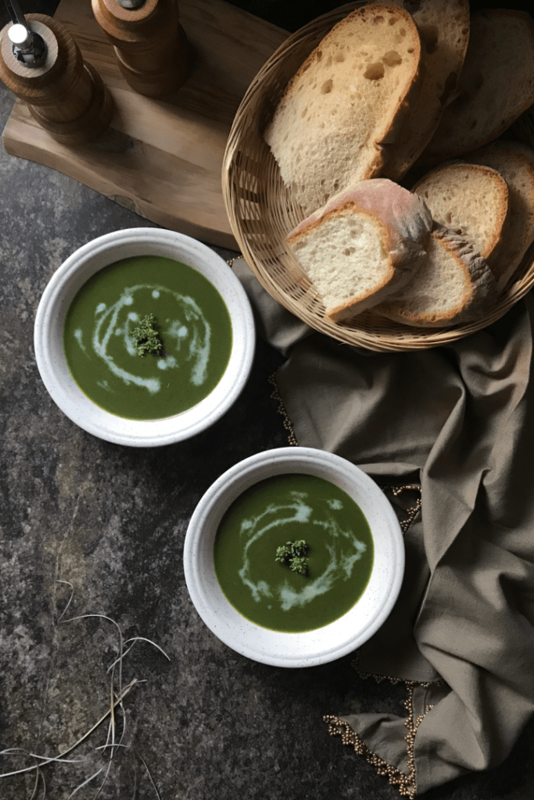 If you love the distinct taste of rapini, you're going to love this Broccoli Rabe Soup! 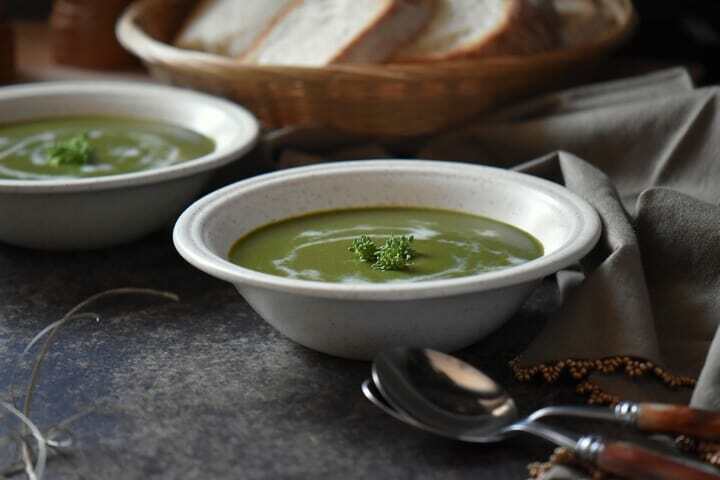 This vegetarian soup has a creamy, silky texture & it's dairy free. Add the onion and cook for about 5-7 minutes until softened and translucent. Add the minced garlic and stir for one minute or so. Add the previously boiled and drained broccoli rabe and stir fry for a few minutes. Season to taste with salt, pepper and chili flakes. Add the vegetable broth, grated potato and bay leaf. Simmer for 12-15 minutes. Remove the pot from the heat and remove bay leaf. With the help of an immersion blender, puree the soup. Re-heat the soup and taste. Adjust seasoning if necessary. 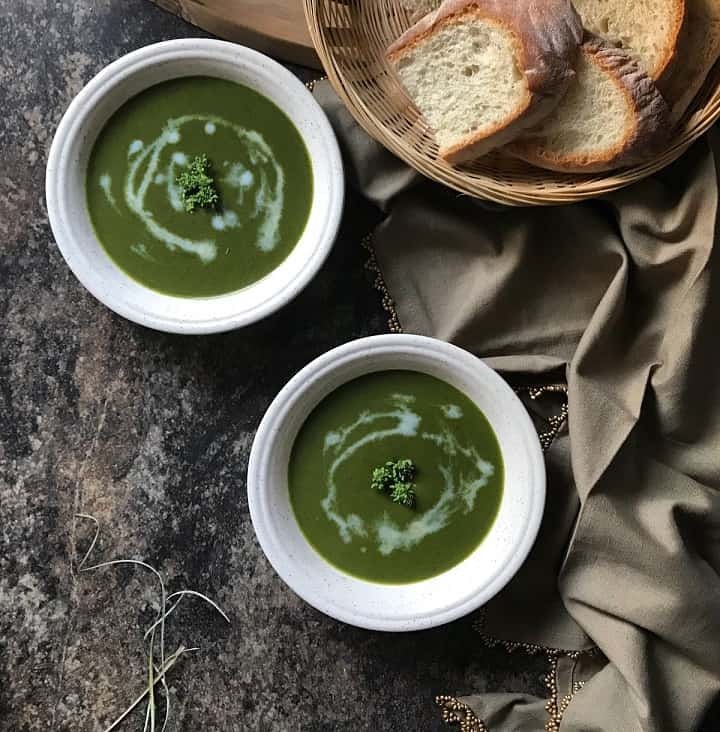 Serve soup and garnish with yogurt, milk or a drizzle of olive oil. I’ve never had broccoli rabe soup… can’t wait to try it. Thanks for sharing Maria! I’ve love broccoli rabe but have never had it as a soup. It sounds great and I like your idea of adding grated potato to the soup…thanks for the tip.